Greetings to you all in the name of our Lord Jesus Christ. I have already taken a long break from my series on Following Jesus. Today, I will continue with the series. Today, I'm going to discuss the second condition which is ''Take up your cross''. 21 Jesus strictly warned them not to tell this to anyone. 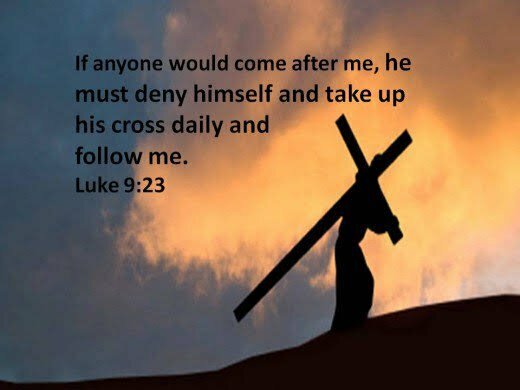 23 Then he said to them all: “Whoever wants to be my disciple must deny themselves and take up their cross daily and follow me. 24 For whoever wants to save their life will lose it, but whoever loses their life for me will save it. 25 What good is it for someone to gain the whole world, and yet lose or forfeit their very self? 26 Whoever is ashamed of me and my words, the Son of Man will be ashamed of them when he comes in his glory and in the glory of the Father and of the holy angels. a sign to be made over a meal and so on. The focus here is to identify what Jesus meant when he spoke to his followers and what the followers then understood it to mean. I will also talk about the implications for us as the followers of Jesus today. The cross during the time of Jesus was the Roman's means of executing criminals who were guilty of capital offenses deserving death. The criminal was expected to carry the cross through the city in full view of the people to the place outside the city where he was to be crucified. In the Bible verses above, Jesus also mentioned the following as regards to his death on the cross: suffering and rejection. At the same time he called the attention of his disciples to losing their lives for Him and not being ashamed of Him. Thanks for reading. In my next post, I will talk about the implications of taking your cross daily. Don't also forget to delegate to steemchurch. Check here to read more about it. You can make use of this tool for easy delegation. Check this post to read more on how to use the tool. Also, join the expansion move of steemchurch to Telos. Follow @sc-telos for updates. Click here to join the Steemmonsters battle. Earn some Steem token and magic token for yourself by playing the Magic Dice game. Congratulations! This post has been upvoted from the communal account, @minnowsupport, by Fatherfaith from the Minnow Support Project. It's a witness project run by aggroed, ausbitbank, teamsteem, someguy123, neoxian, followbtcnews, and netuoso. The goal is to help Steemit grow by supporting Minnows. Please find us at the Peace, Abundance, and Liberty Network (PALnet) Discord Channel. It's a completely public and open space to all members of the Steemit community who voluntarily choose to be there. Hello! I find your post valuable for the wafrica community! Thanks for the great post! We encourage and support quality contents and projects from the West African region. Do you have a suggestion, concern or want to appear as a guest author on WAfrica, join our discord server and discuss with a member of our curation team. Don't forget to join us every Sunday by 20:30GMT for our Sunday WAFRO party on our discord channel. Thank you. Your UA account score is currently 3.313 which ranks you at #7953 across all Steem accounts. Your rank has dropped 16 places in the last three days (old rank 7937). In our last Algorithmic Curation Round, consisting of 374 contributions, your post is ranked at #329. You're on the right track, try to gather more followers. The readers like your work! Try to work on user engagement: the more people that interact with you via the comments, the higher your UA score! Your post has been voted as a part of eSteem encouragement program. Keep up the good work! Install Android, iOS Mobile app or Windows, Mac, Linux Surfer app, if you haven't already!